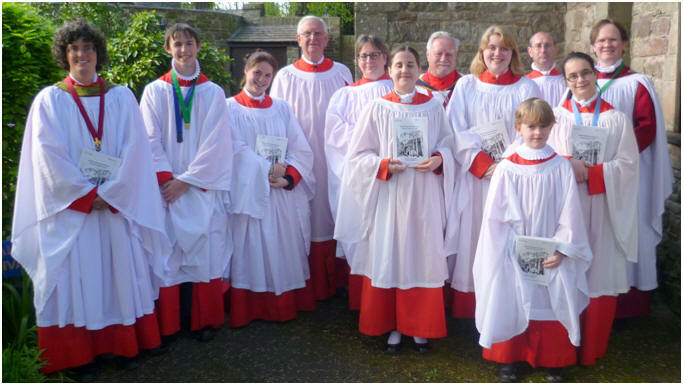 On May 14th 13 members of St Mary's Choir took part in the RSCM Choral Festival in Brecon Cathedral directed by Mark Duthie, the Director of Music at the Cathedral. It was a most enjoyable experience rehearsing and singing Choral Evensong with other choirs from the Swansea and Brecon Area. The music included "If ye love me" by Tallis as introit, canticles by C.H. LLoyd in A and the lovely anthem "The Spirit of the Lord" by Edward Elgar. Over the past few months Dr William Reynolds has been busy editing anthems from a set of manuscripts compiled in the 1630s for Sir Thomas Myddelton’s household Chapel at Chirk Castle, near Wrexham, and now deposited in New York Public Library and Christ Church Library, Oxford. He was recently interviewed about his musicological research on BBC Radio 3 (Saturday 14th June) during a live broadcast of a concert from Chirk Castle as part of the Gregynog Festival. The concert was performed by early music choir The Brabant Ensemble and aptly reunited the music of the manuscripts with their provenance, harking back to the decade approaching the Civil War. The programme included music by well-known 16th and 17th century composers, Byrd, Gibbons and Tallis, and featured two anthems unique to the Chirk manuscripts newly transcribed and edited for the occasion by Dr Reynolds – The King shall rejoice by John Amner, organist of Ely Cathedral, and Lord, in thy wrath by William Deane, organist of Chirk Castle – and received their first public performance in over 350 years. The concert was in memory of musicologist Dr David Evans (1943-2013) who sang tenor in St Mary’s Choir, Swansea during the 1960s, and until his retirement was a senior lecturer in the School of Music at Bangor University.